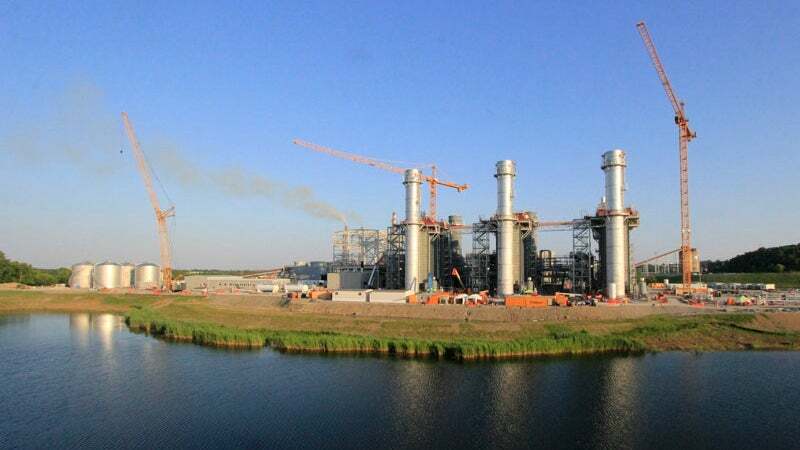 A new combined-cycle power plant will replace two coal-fired units at Paradise’s fossil plant located in Kentucky, US. Image: courtesy of Tennessee Valley Authority. Combustion testing for the new combined-cycle plant was carried out in October 2016. Image: courtesy of Tennessee Valley Authority. Operated by Tennessee Valley Authority, the new plant will have a capacity of 1,100MW. Image: courtesy of Tennessee Valley Authority. Tennessee Valley Authority (TVA) is replacing two coal-fired units of its Paradise fossil plant with a combined-cycle power plant at a cost of approximately $1bn. Built in 1963, the plant is located near Drakesboro, Kentucky, and includes three coal-fired units. The third coal-fired unit, which came online in 1970, will continue to be operational. The new combined-cycle power plant will have a capacity of 1,100MW, which will be sufficient to power 640,000 homes and businesses. The plant is expected to become fully operational in early-2017. Investment in the new plant is part of TVA’s strategy to have a balanced portfolio. The plant will provide TVA with the flexibility to quickly meet demand and also reduce carbon emissions by roughly 50%. The new combined-cycle power plant will include three GE 7FA.05 gas turbines and one Toshiba steam turbine. The 7FA.05 gas turbines provide start up within 11 minutes and have an efficiency of 60% and reliability of 98.8%. The facility will additionally feature heat recovery steam generators with supplemental firing, a steam surface condenser, ABB XFORMER transformer, and a mechanical draft cooling tower. Construction on the project commenced in March 2015 and the upper segments of the exhaust stacks were put in place by early-2016. In addition, 1.326 million ft of linear cable, 71,000ft of linear underground pipe and 60,000ft of above-ground pipe were installed by June 2016. Since the start of construction, 1.7 million man-hours have been spent on various works on the site including the erection of 4,400t of structural steel, excavation of 286,000yd² of earth and pouring of 35,000yd² of concrete. The new plant will generate power through the normal combined-cycle process wherein natural gas or diesel gas is burned to drive the gas turbine generators to produce electricity. The hot exhaust generated during the process is captured to convert water into steam in the heat recovery steam generators. The high-pressure steam drives the steam turbine generator to produce additional electricity. The steam from the steam turbine generator is condensed into water and recycled. "The plant will provide TVA with the flexibility to quickly meet demand and also reduce carbon emissions by roughly 50%." Combustion testing for the first unit of the plant commenced in October 2016. The testing process included the introduction and ignition of natural gas fuel into the combustion turbine and bringing the turbine up to operating speed to ensure the system works. Upon completion of combustion tests, the steam systems of the plant will be tested to ensure they are free of debris. Initial testing and steam system restoration of the turbines is expected to be achieved by February 2017. Full load testing will then be carried out on all the three combustion turbines and the steam turbine-generator. Kiewit Corporation was awarded the engineering, procurement and construction contract for the project. The site development contract was awarded to Phillips & Jordan. The scope of the contract, which required the use of more than 40 pieces of heavy equipment, included clearing and grubbing, excavation, grading of the site, storm drainage and outlet control structures installation, and permanent seeding. Vogt Power International was contracted to supply the heat recovery steam generators. TVA has been increasingly focussing on its natural gas-fired power generation portfolio and moving away from coal-fired generation to ensure reliability and grid stability. Natural gas accounted for 19% of TVA’s generation portfolio in 2015, as compared to 10% in 2007, while coal generation accounted for 58%. TVA expects natural gas to account for 23% of its generation portfolio and coal-fired generation to decrease to 22% by 2020. With very low levels of emissions, natural gas will enable TVA to provide clean and reliable energy to residents and businesses of Tennessee Valley. Despite the higher operational costs of natural gas-fired power plants, their fast start times and flexibility are expected to help TVA meet demand during peak periods. TVA currently runs 106 natural gas and fuel oil-fired generators at 14 locations including seven in Tennessee, five in Mississippi, and one each in Alabama and Kentucky. Together, the plants have a generation capacity of approximately 7,000MW, which is enough to power four million homes. International Energy Resources (IER) is a specialist in the acquisition and re-application of new and used gas turbines for GE, Thomassen, Hitachi, Alstom, AEG Kanis, BHEL and Nuovo Pignone (Frame 3, 5, 6B and 9E) GE Stewart & Stevenson (LM2500 and LM6000), Solar (Saturn, Centaur and Taurus), Rolls Royce (Avon 1533 and 1535) as well as (Siemens / EGT / Alstom / Ruston) TA1750, TB4000, TB5000, TB5400, and SGT100, SGT200, SGT300 and SGT400. WIROMET is a well-known and experienced manufacturer of high-quality devices for the power generation and mining industries. We belong to a small group of manufacturers of steam turbine blades and other steam turbine flow system parts. In over 50 years we have acquired much experience in the field of production technology.